Hello and welcome to this week’s Confetti Camera with Tricia Barber! In this weekly segment, one of the Confetti Crew designers will have the camera on both themselves, as a designer, and on their Reverse Confetti creations. For this round each of our designers are showcasing unique ways to use Confetti Cuts dies. 1) This segment will not “air” if there is a different post scheduled for that day, such as Sketch for You to Try on the 1st of each month or on a hop or sneak peek day. 2) Each designer will follow the same theme until we have featured every Confetti Crew Design Team Member (then it’s a new round with new questions/theme). Hello ‘Fetti Friends! It’s Tricia here today to share with you another creative way to use your Confetti Cuts. Today, I thought I would share one of the things that I love to do to stretch my supplies using the partial die cutting technique. You can change the shape of your die cut images and stretch or shorten them to be used in new ways. Today, I am using the Scalloped Squares Confetti Cuts. To partial die cut, you place your die on your cardstock and when you place the die on your die cutting plate, leave it partial hanging off. Send it thru your die cutting machine and it will only cut what is under the plate. Next you will shift the die either smaller or larger depending on what you want to create. I use the grooves in the die to line it back up with the already cut lines. Then place on your cutting plate again hanging off the paper that has already been cut. You can trim off the paper around the die cut so that you can see where the cut edge ends and see where to line up the die for the second cut. Then send it thru the die cutting machine again and you will either stretch or shorten the the shape of your die cut! See the pictures below to see the different shapes that I made from the Scalloped Square Confetti Cuts. I used the Large Scalloped Square and shortened the die cut using the partial die cutting technique to create a Scalloped Rectangle. I inked blended on the background piece with Pistachio and Parakeet dye inks. I stamped a sentiment from the Simply Sentiments stamp set using Midnight ink. I used the Heart Spots stamp set and stamped on Premier Polar White cardstock and colored with my Copic markers. I die cut my images with the Heart Spots Confetti Cuts and created a small scene for my Scalloped Rectangle. I used Elemental Stripes to create my tone on tone background. I hope that I have inspired you to look at your Confetti Cuts and see what other shapes you can create with them! I hope you give this technique a try! Hello and welcome to this week’s Confetti Camera with Jeanne Jachna! Jeanne here with today’s Confetti Camera! I’m sharing some methods to stretch your dies by using them in different and unique ways. Dies are my favorite paper crafting product so I had lots of fun making this card for today! I started by water coloring a border of Salty Ocean Distress Ink on a piece of watercolor paper. When it was dry, I used the Reverse CHEVRON PRETTY PANELS Confetti Cut as a stencil to add more color. I used a stencil brush to add stripes of color in the white spaces around the design. Since the pattern repeats it’s easy to lift the die cut, match the pattern and extend the lines. I die cut the “Thanks” word die from the HELLO & THANKS LABEL set from the watercolor panel. I cut the die 3 more times – stacking the dies to add some dimension and make the thanks message easy to see. Finally I added some texture by spreading light molding paste over the CHEVRON PRETTY PANELS die cut (make sure you use a clean one – the distress ink will color the paste!) When I removed the panel I gave the molding paste a sprinkle of fine white glitter. 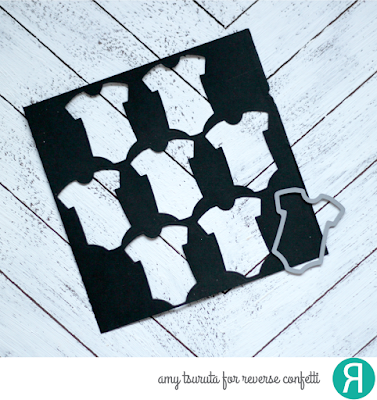 Clean up is easy – no stencil to wash – just toss the die cut paper panel. With the background panel complete, it was time to embellish it! I layered die cut WHEAT and LEAFY and LAYERED LAURELS behind a stamped and die cut BUTTERFLY DREAMS Butterfly. Try cutting your dies from different materials like glitter or pattern paper, foil, vellum, wood veneer or felt for different looks. Sometimes a solid image gives better contrast on a busy background. I didn’t remove the die cut pieces from the WHEAT Confetti Cut on this project. The solid gold foil images break up the background design. I hope this card gives you ideas for different ways to use your die cuts. You’ll get more use from your die cuts and be delighted with the things you make! 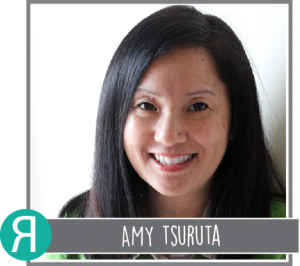 Hello and welcome to this week’s Confetti Camera with Kelly Lunceford! For my card, I wanted to create an inlaid shaker element as well as some fun, coordinating shrinky dink confetti cuts to add as the shaking element in my window. I think this bear looks adorable surrounded by bushels of juicy apples. To begin, I got to work creating all of the little apples for the shaker element. I stamped the apple images onto “Ruff and Ready” Shrinky Dink sheets using black ink. I also colored them with Copic Markers; some red and some green. I used my heat tool to shrink them lickety split! Once I had enough to fill my shaker window, I set them aside and got to work on the rest of the card. I used the Stitched Rays Cover Panel and then did some ink blending for a sunshine-y background. I also added a strip of Fun Times pattern paper to the bottom to look like grass. Once those two elements were in place, I was able to die cut the larger bear using the Honey Bear Confetti Cuts. After that was done, I was able to stamp the outline of the bear using the Honey Bear stamp set onto the card base. I used the outline as a guide and then stamped the bear through the hole. You could also use a stamp positioning tool if you don’t feel confident in your placement. I added a piece of acetate onto the back of the die cut panel using scor tape. I colored the bear on the card base using Copic markers. Once that was done, I was able to add the Shrinky Dink shaker elements over the bear and then carefully put the focal piece over the top using foam tape to secure the shaking pieces. I also added foam tape around the rest of the perimeter of the focal piece for stability. After I had the shaker element complete, I just had more fun adding the rest of the die cut and stamped pieces for my scene! I hope you will give these techniques a try, because they are so much fun! Hello! 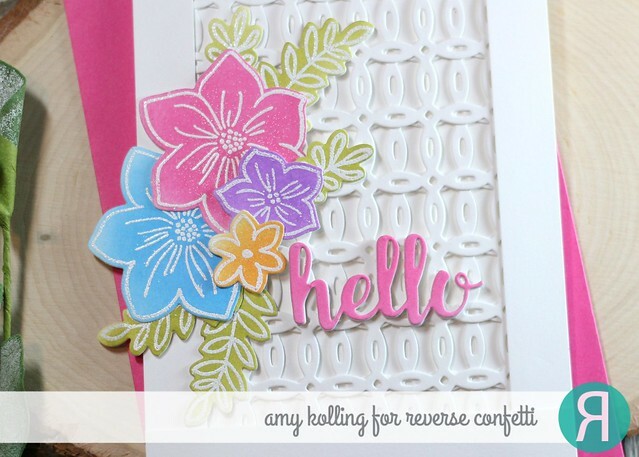 Amy Kolling here with my card for the current segment of Confetti Camera: using dies in creative ways. I love to find ways to get more out of my cover panels from Reverse Confetti. I did a layering technique of my cover panel. I thought the Linked Circles Cover Panel Confetti Cuts would look amazing if I layered one panel over the top of another but shifting it a bit. This creates a whole new look to this panel! I simply die cut two, white panels, layered them together and trimmed down. I added this panel to my notecard and created some white panels to “frame” my new background. Using my trimmed layered panel, I added some Distress Oxide inked flowers from Build a Bunch. These were die cut, arranged with Press ‘n Seal, and adhered to my card. A “hello” was die cut from the Hello & Thanks Label Confetti Cuts using a scrap of cardstock that had been colored with Picked Raspberry Distress Oxide ink. Here’s a closeup of the background and the flowers. Layering your cover plates will give you lots more options for backgrounds, focal elements, etc. Thanks so much for stopping by! I die cut the Leaf Lattice Cover Panel just from simple white cardstock, then laid it over a panel of Stone Cardstock and added white embossing paste to the bottom right corner and top left corner of the panel. 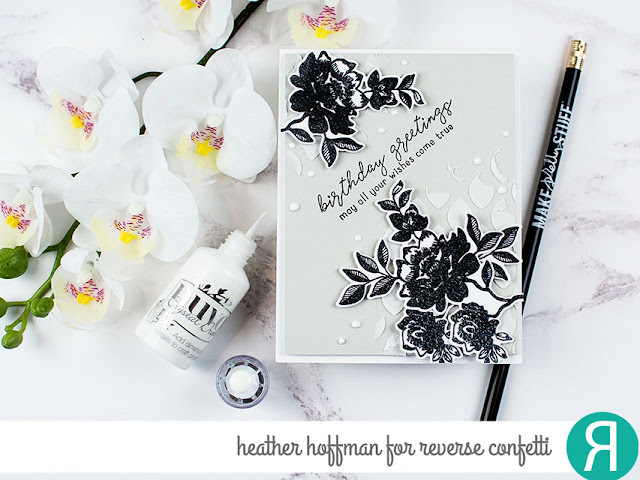 While that dried, I stamped the flower image from Something Wonderful in black pigment ink, then heat embossed with sparkly clear embossing powder and die cut with the coordinating Something Wonderful Confetti Cuts. I stamped a sentiment from Tall Blooms on a diagonal in the center, then adhered the the flowers over the top with foam adhesive. Since I trimmed some extra off the one in the top left corner, I tucked those extra pieces under the one on the bottom right to give it a more full effect. Finished off with some White Gloss Nuvo Drops, then mounting that front panel on a white cardbase. 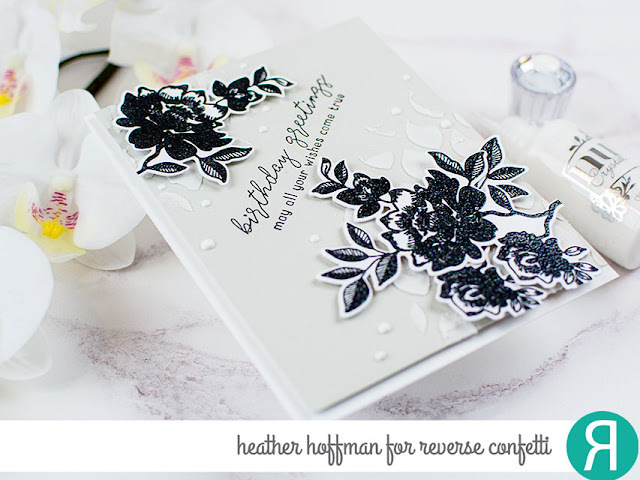 I love the look of embossing paste – and this gives you one more way to use those Cover Panels! Thanks for stopping by! 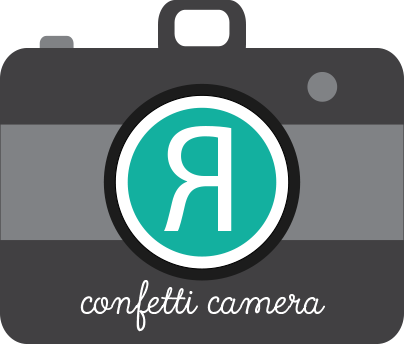 Hello, ‘Fetti Fans and welcome to CONFETTI CAMERA! Well hello there ‘Fetti Fans! Today I have another unique way to use your dies. I’ve created a shaker card with the Butterfly Dreams Confetti Cuts. I started by cutting the large butterfly from the white panel and then did my stamping on it as well using the Whole Lotta Dots and the Take Flight stamp sets in Stone ink. I then turned it over, added the acetate “window” and built my shaker area with foam tape following the shape of the butterfly. Once everything was added into the shaker area, I then sealed it with the green patterned paper from the new Fun Times 6×6 paper pad, and added the panel to my card base. I created the little flower by cutting it from some wool felt using the Blooms ‘N Buds Confetti Cuts and then just hand=cut the leaf. I stamped the sentiment from the Kitchen Love stamp set in Navy ink onto the smaller of the Tag Duo Confetti Cuts set. The embellishing part went pretty fast and easy with a little hot glue! I love making shaker cards and this one is probably one of my favorites yet! I think you could use any larger die to make the opening. You could also try putting different elements inside the shaker part! Hello, ‘Fetti Fans and Happy ALMOST Friday! To create my card, I started off by watercoloring a background using pan watercolors in shades of blue and green. Then I added some black watercolor splatters for an artsy feel. When the background was dry, I trimmed it down to 4″ x 5.25″. I positioned the largest butterfly die from the Butterfly Dreams Confetti Cuts die set on the background where I wanted it, using low tack tape to hold it in place. My intention was to diecut the butterfly wings, but leave the center of the butterfly intact. I ran the die through my machine once to cut the left wing, placing my top plate exactly where I wanted the die to stop cutting. Then I repeated this step for the right wing by running the die through my machine a second time. This time I moved the plate slightly so that there is about 1/8″ in the center of the butterfly that remained uncut. This allows me to achieve awesome dimension without having to use any foam tape or extra layers. All I did was fold up each wing gently. Before folding up the wings, I stamped several line images from the Whole Lotta Thanks stamp set in the center of the butterfly. The dotted line from the set was stamped in Midnight ink, and the solid line from the set was stamped in Lagoon ink. I wanted these lines to make it look as though the body of the butterfly was stitched in place with a sewing machine. Since I can’t sew, this is a great alternative for me! Below the butterfly, I stamped a sentiment from the Whole Lotta Thanks stamp set in Midnight ink. For added interest behind the butterfly, I added a piece of black and white patterned paper from the Every Little Bit 6×6 paper pad, and then adhered the panel to an A2 card base cut from Midnight cardstock. To finish things off, I added a scattering of black sequins. Hello and Happy Thursday, ‘Fetti Fans! Hi ‘Fetti Friends! Today I’m featuring a project that uses Confetti Cuts in a unique way. I used the Onesie confetti cut and made a stencil. I decided to make it 6×6 for ease of placement. Using Midnight cardstock makes for a cleaner reusable design. I’m not one that necessarily uses traditional colors so I went with Iced Aqua + Lime Green. 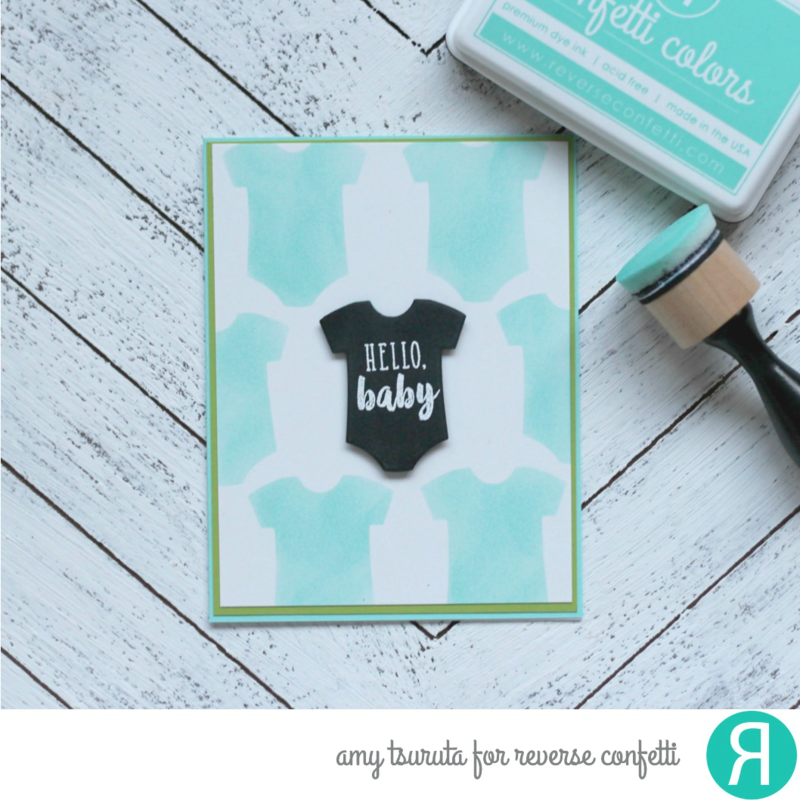 Why not use one of the stencil die cuts as part of my card design?! The sentiment is from the Simply Sentiments stamp set. It has been heat embossed in white. I love the repeating design and will probably design something similar to send something to the ‘big sister’. That’s it for me, thanks so much for stopping by today! Hello and Happy Friday, ‘Fetti Fans! While you usually will see Confetti Camera here on Thursdays, we have a “special edition” to share with you today. And, by special edition I mean that we had to accommodate some schedules and this ended up getting pushed back a bit. It’s here now and I’d like to think that good things come to those who wait. In this weekly (usually Thursday) segment, one of the Confetti Crew designers will have the camera on both themselves, as a designer, and on their Reverse Confetti creations. Hi all!! Today I am sharing my project using Confetti Cuts in unique ways. I am horrible at math and struggle with dividing or using thirds. So I used the Squared Off Cover Panel Confetti Cut to help with that! I placed the panel on a piece of Polar White cardstock and easily “eyeballed” where I needed to make my grid marks. I used the heart die from Congratulations Confetti Cuts and created little butterflies which I adhered onto my grid marks. Easy peasy!! I added a bit of stitching to create the butterfly bodies, a Forever My Love panel, and finished my card off with a sentiment from Crazy About You. I had so much FUN thinking outside the box with this butterfly card! Greetings, ‘Fetti Fans and welcome to our newest round of Confetti Camera! Welcome! It’s Lisa Henke here with the next round of Confetti Camera. Our theme this round is to use Confetti Cuts in unique ways. I was in the mood for some cute and easy Valentine projects. I channeled my inner preschool self and pulled out a bunch of my heart Confetti Cuts and decided to make some LOVE BUGS. I decided on using the Stamped Note Confetti Cuts hearts for my projects today. For my first project, I cut them in Salsa, Premium Polar White, Midnight and vellum card stock. My first one used four of the cut out hearts and I layered them together for a darling Love Bug for my tag and gifty. I filled up a Clear Mini Box with red M&M’s and tied on a bow. I added one of the Tag Duo Confetti Cuts in Piggy Bank card stock. I stamped the sentiment from the just released Heart Filled Sentiments in Midnight ink. Gosh, how I love that black ink for my sentiments. Here is a close up of the tag and Love Bug. I added googly eyes and some twine antennas. Next I have a rainbow cutie that I made with a row of hearts glued together, I call him a Lovepillar. I used Salsa, Bumble Bee, Tangerine, Lime Green, and RC Aqua card stocks and the Stamped Note Confetti Cut to create the body and head for the Lovepillar. I cut an extra heart in Piggy Bank for his head. I added googly eyes and twine for his antennas, too. I used a different sentiment from Heart Filled Sentiments and the same Midnight ink along the bottom of the Kindness Cards Confetti Cut. I love how the rounded rectangle can make such a quick and easy little note card, perfect for handmade notes. I drew in the little feet and accented the card with the little teeny red hearts from the Shaker ‘n Frames Confetti Cuts. It is fun to create little Love Bugs with hearts. You can make them all different sizes depending on which Confetti Cut hearts you choose to use. Thanks for stopping by today.